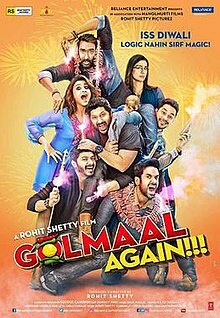 ^ "'Golmaal Again': Interesting facts about the film - TOI Mobile | The Times of India Mobile Site". m.timesofindia.com. Retrieved 6 October 2017. ^ "Itna Sannata Kyun Hai Full Song". YouTube. Retrieved 26 May 2018. ^ "Watch Golmaal Again song Hum Nahi Sudhrenge: Ajay Devgn and gang give us a feel-good number". The Indian Express. 6 October 2017. Retrieved 6 October 2017.